Mayor Muriel Bowser signs the Res. 13/Hill East LDA with Chris Donatelli of Donatelli Development (left) and Scottie Irving of Blue Skye Construction (right) as Ward 6 Councilmember Charles Allen and Brian Kenner, Acting Deputy Mayor for Planning and Economic Development, look on. After twelve long years, the city is finally moving forward on mixed use development at Reservation 13! 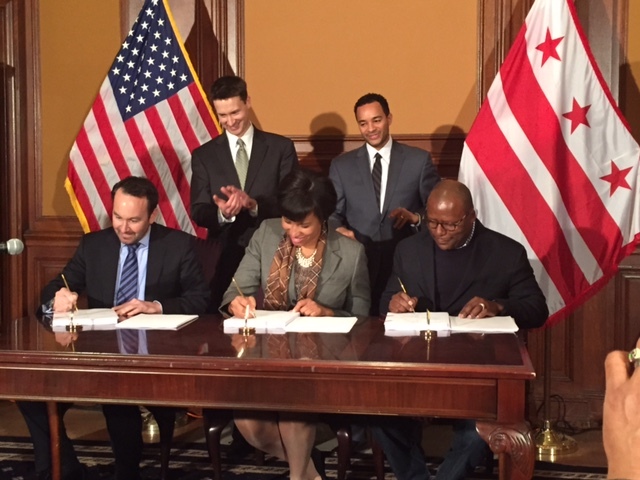 Today, Mayor Muriel Bowser signed the Land Disposition Agreement (LDA) for Phase I of the Res. 13/Hill East Development. The agreement allows Donatelli/Blue Skye development to move forward with design, permitting and construction of their mixed-use project for Parcels F1 & G1 on the site. Donatelli/Blue Skye plan to build two buildings surrounding the Stadium-Armory Metro Plaza. The mixed-use buildings will include 354 residential units and 40,000 square feet of retail (20,000 sf in each building). Thirty percent, or 106, of the residential units will be affordable. Michael Neibauer of the Washington Business Journal is reporting that Donatelli/Blue Skye hope to break ground in 2016 with completion slated for 2018. Obviously, this is a big day for Hill East. I want to thank Mayor Bowser for making the Hill East LDA her first LDA signing as Mayor and for her strong support of the project. I also want to acknowledge the contributions of Ward 6 Councilmember Charles Allen, Ward 7 Councilmember Yvette Alexander, former Mayor Gray, former Ward 6 Councilmembers Tommy Wells and Sharon Ambrose, former ANC 6B Commissioners Francis Campbell and Ken Jarboe and the many Hill East residents who have continued to push the city to move forward on this long-stalled development. In addition, I want to thank Donatelli Development and Blue Skye Construction for pursuing development plans at Reservation 13 and our ANC 7F colleagues for their support. Of course, this is only the first phase of the full development. The Mayor and Council need to act now to prepare the rest of the site for development. I plan on continuing to work with my colleagues on ANC 6B and ANC 7F to make sure that pursuing the entire Res. 13/Hill East Development remains a priority. This entry was posted on Monday, March 2nd, 2015 at 3:29 pm and is filed under Development, Reservation 13/Hill East Waterfront, Uncategorized. You can follow any responses to this entry through the RSS 2.0 feed. You can leave a response, or trackback from your own site. One small step. But at least it is a step. Why wasn’t Yvette Alexander at the signing? Its in her ward right?